Lorian Epstein has been a devoted animal lover since she was old enough to coax the stray neighborhood cats and dogs off the street and help return them home (or adopt them!). She got involved with, and subsequently hooked on, dog training and behavior modification in middle school with a rescued stray dog, Loki. Lorian spent hours researching and practicing training methods, and eventually became a certified Petco dog trainer and taught private and group dog training classes. In 2015, Lorian became a volunteer at Austin Animal Center, fell in love with the shelter and no-kill commitment, and never looked back. 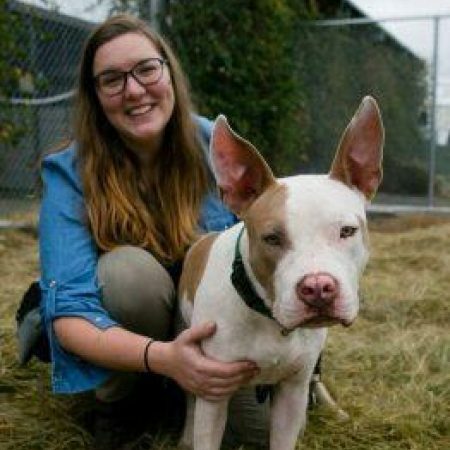 Lorian was hired as the group volunteer coordinator in August of 2016, and then transferred into the adult dog foster coordinator role in January of 2017. She teaches others about creating and managing successful dog foster programs in the Dog Foster Program Apprenticeship and Maddie’s Lifesaving Academy. Lorian continues to volunteer and expand her knowledge and skills with positive reinforcement training, and is passionate about finding excellent homes for Austin’s longest-stay, adult dogs by way of the foster program. Lorian currently lives with her soul-dog, Bentley, who came into her life with generalized high anxiety, separation anxiety, and leash reactivity. The two have spent ten years helping each other learn and grow into better, balanced beings!